Robert George Pickett (February 11, 1938 – April 25, 2007), known by the pen name Bobby "Boris" Pickett, was an American singer, best known for co-writing and performing the 1962 hit novelty song "Monster Mash." Bobby was fascinated by horror movies as a child. By the time he was nine, he started to imitate Boris Karloff, whom he would see at the movie theatre that his father managed in Somerville, Massachusetts. Following his discharge from the US Army in 1961, he moved to Los Angeles to try his hand at show business. As a member of a vocal group called The Cordials he would do impersonations between songs, often using his impression of Karloff, which was a crowd favourite. His friend and fellow band mate, Lenny Capizi suggested that the pair try to take advantage of the novelty song craze that was happening in the early sixties by writing a tune around Bobby's Karloff imitation. It took nearly a year after the suggestion to get around to it, but when they did, the two worked out "The Monster Mash" in about a half an hour. To record their song they approached producer Gary Paxton, who sang The Hollywood Argyles' 1960 number one hit, "Alley Oop". 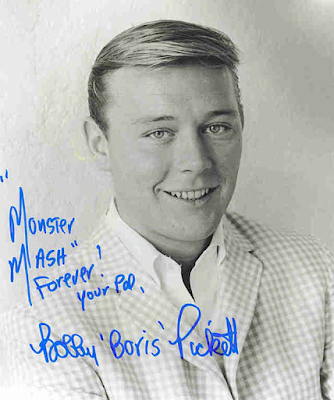 Pickett and Paxton, along with Leon Russell, Johnny McCrae and Rickie Page recorded the tune in one take, and when the session was done, it was Paxton who came up with the idea of putting "Bobby 'Boris' Pickett And The Cryptkickers" on the record's label. Pickett also added all his own sound effects: the creaky door opening is a nail being pulled from a piece of wood, the boiling cauldron is Pickett blowing bubbles into a cup of water with a straw, and the chains are him moving chains up and down. Gary Paxton took the tape to four major labels, who all turned it down. 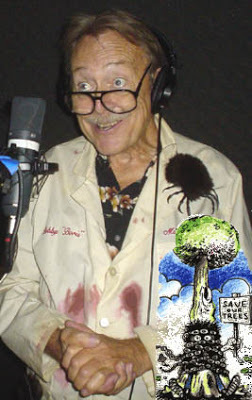 Not discouraged, he had a thousand copies pressed himself and started delivering them to radio stations across California. Soon, "The Monster Mash" was getting air play and London Records, who had rejected the song earlier, called Paxton to sign a deal. 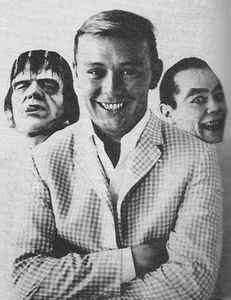 Eight weeks later, on October 20, 1962, the record hit number one on the Billboard Hot 100, just in time for Halloween. Over the years, the song has been re-released three times and re-entered the Hot 100 on August 29, 1970, peaking at number 91 and again in May of 1972, when it reached number 10. Several attempts were made at other "monster" songs. A Christmas-themed follow-up called "Monster's Holiday" was also issued in 1962 and reached #30 in December of that year. "Blood Bank Blues", "Werewolf Watusi" and "Monster Swim" followed, but all failed to chart. Pickett did manage to reach the Billboard chart again in June, 1963 when "Graduation Day" peaked at #80. In 1975, he recorded a spoof on Star Trek called "Star Drek" with Peter Ferrara. In 1985 he released "Monster Rap", which describes the mad scientist's frustration at being unable to teach his creation how to talk. The problem is solved when the monster learns to rap. 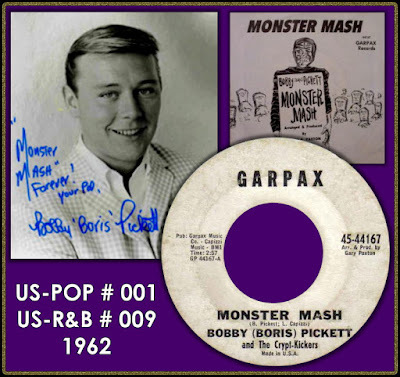 "The Monster Mash" has been the recipient of three Gold records, selling an estimated 4 million copies since its release, and is one of only three records to ever hit the Billboard Hot 100 on three separate occasions. The song has become a part of American pop culture, so much so, that it has even been played to wake up the astronauts on Halloween Day. The song has been used in several movies, including Sweetheart's Dance and "Halloween III and has been heard on such popular TV shows as The Simpsons, Cheers, Rosanne, Doogie Howser, Happy Days, and Sesame Street. Even Boris Karloff himself sang the song on mid-sixties TV. As for Bobby, he remained in demand for Halloween performances and continued to tour at small venues and special events throughout the US. 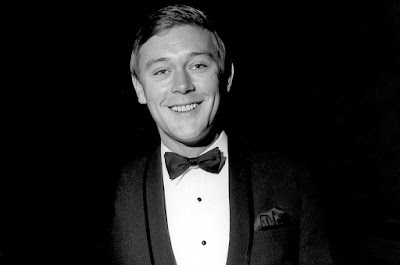 In 1966 he hosted a weekly disc jockey show on KRLA in Los Angeles and later worked as a writer and an actor, appearing in the films It's a Bikini World in 1967, Chrome and Hot Leather in 1971, Deathmaster in 1972 and Lobster Man From Mars in 1989. 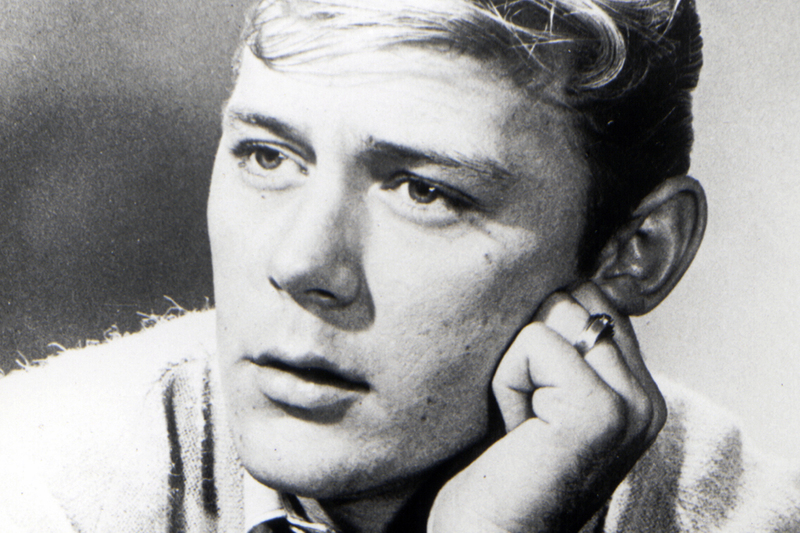 Pickett and television author Sheldon Allman wrote the musical Frankenstein Unbound. 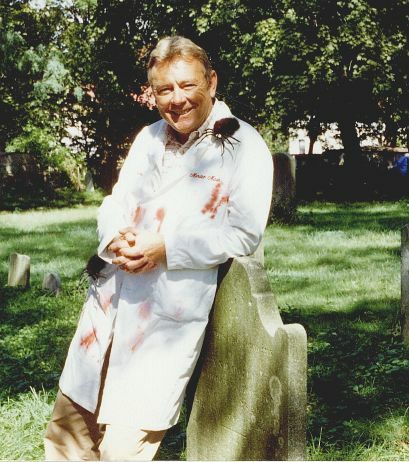 In 1995 the co-writers of Disney's Toy Story, Joel Cohen and Alec Sokolow, produced a movie of it, originally entitled Frankenstein Sings, but later released in the US under Monster Mash: The Movie in which Pickett starred. Thanks for this one BoppinBob, nothing like a bit of crypt kicking' on a frosty Monday morning. Mordor Lives? Excellent - thanks for the re-up, Bob! And thanks for checking out the blog! Let me know if anything there strikes your fancy!